Today is Fettuccine Alfredo Day. No, I have no idea why. Mine is not to question; mine is only to produce the food and comment on its tastiness (or lack thereof). I love fettuccine alfredo. LOVE. But it’s not the sort of thing that one really needs to be making and/or consuming on a regular basis when one comes from sturdy peasant stock genetically engineered to withstand famine, so it’s more the type of food I only eat when out at a restaurant, and not so much when I’m pondering meal plans at home. But this month is all about making whatever the National Day’s food is, so I hit up Google and looked for some slightly lighter versions. The classic recipe starts with a roux, which is just butter and flour, but then continues on with cream and lots of cheese, and people, there is a *reason* why it is so incredibly delicious. This recipe, however, makes it ever so slightly less a calorie-bomb, in that it makes use of milk and broth instead of the cream. The roux is still there, of course, because that’s the thickening agent, and also the cheese, because without cheese what would be the *point*? 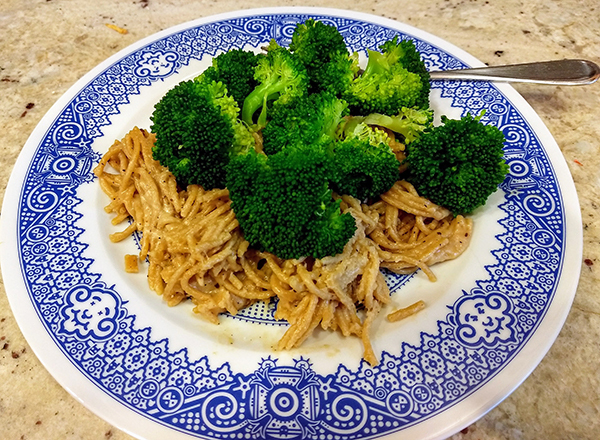 We had it with a pile of steamed broccoli on top, because it really needed some color and also some additional texture. I would have sprinkled more Parmesan on top of that (because the answer to so many things about food is ‘more cheese’), except that I used up every bit of Parmesan in the house to make the sauce. Alas. It’s not as pretty here as it could have been, but that’s only because I made it this morning, before heading off to work since there wasn’t going to be time after work to make it before Richard needed to leave for his meeting, and this is not a dish that reheats into the same beautiful vision as it is when it’s first cooked. Also I didn’t use fettuccine, because there wasn’t any in the house and pasta is pasta is pasta (yes, yes, I know, you purists out there are violently disagreeing with me, but you can just go make your own and be done with it). It tasted fine, although not exactly like true fettuccine alfredo. I might be tempted to up the spices a bit next time, if I ever decide to make it again, and also add some chicken. And also some cream, because there is a reason the original recipe is so very much better.